Although dropshipping is an easy and low-cost online business to start, it can feel overwhelming when trying to figure out the easiest way to get started. When I start an online business, I seek out the best way to start by using quality software and without spending a ton on monthly expenses. 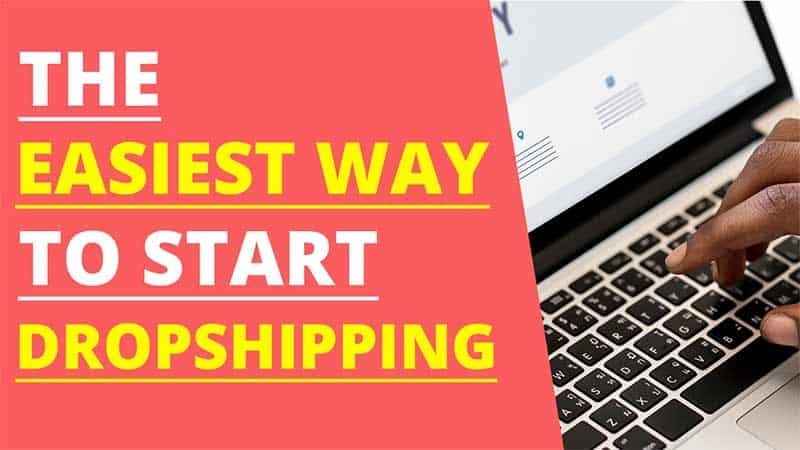 The good news is if you’re ready to start dropshipping, I’ll explain the easiest way to start dropshipping using all FREE software. You will have your own store that you retain 100% ownership of with zero monthly software fees. For the set up I’m discussing here, you will be sourcing products directly from AliExpress.com. Using AliExpress as your dropshipping supplier is one of the easiest ways to build your store. That is because they are one of the largest online retailers and they carry millions of products. There are no requirements or registration fees to begin selling. They also do not cap you on the number of items that you sell or limit you on your profit margins. They ship worldwide and most of the items include free shipping. One thing to know is that most of the manufacturers on the website are based in China. However, ePacket shipping has lessened the shipping time from China to the United States. Here is a great post explaining why AliExpress shipping times won’t affect your business. Before I get into setting up your store, I want to briefly cover how the dropship model works. The primary benefit of being a dropshipper is that you can open up your own eCommerce business but do not have to physically handle any inventory. You do not have to buy products in advance and store them in your home or a storage facility. That alone saves you a ton of money in start-up costs and storage fees. Another benefit is that you do not have to ship items to your customers. When an order is placed in your store, you then pass along the payment and shipping details to your supplier. Your supplier then ships the item to your customer for you. Therefore, you have no worry about shipping and handling. 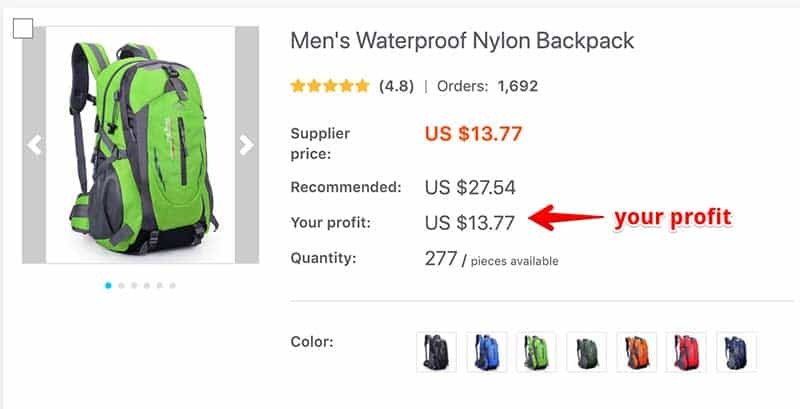 Your profit is the difference in price between what you charged the customer and what the dropshipping supplier has charged you. The supplier price on AliExpress is $13.77. You charge $27.54 in your store. When a customer orders the backpack, you pay your supplier $13.77 and the difference is your profit which in this case is $13.77. Setting up your store with WordPress is extremely easy. You do not need any technical background to do so. You can accomplish these steps in one place. The store that I set up for testing is hosted with HostPapa. I use and recommend their Optimized WordPress Hosting plans because they provide you with a free domain name and they will auto-install WordPress for you. Continue with your payment process and your account will be set up and WordPress will be installed automatically onto your new domain name. 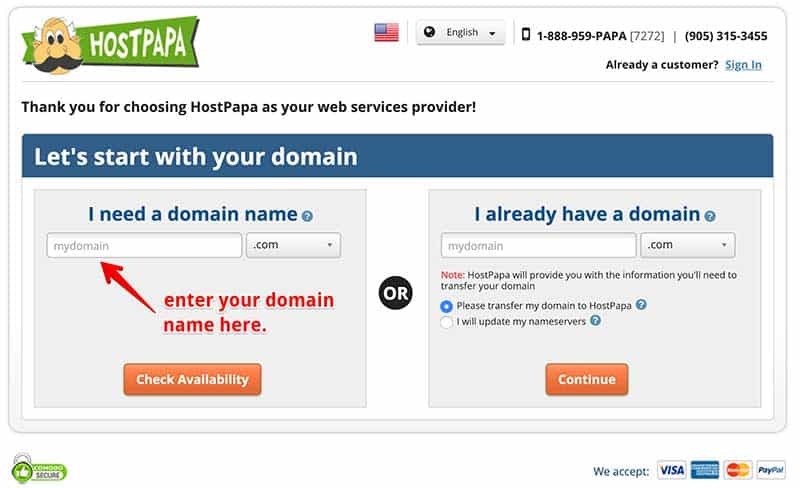 HostPapa will then send you a confirmation email letting you know when everything has been completed. The email will also provide you with details for accessing your CPanel and WordPress website. WooCommerce is a free WordPress plugin that turns your WordPress website into a full-featured eCommerce business. There are tons of WooCommerce themes that you can choose from. Some are free and some have a fee. You can start off with the Storefront theme to get started. You can upload your theme under the “Themes” tab in your WordPress admin. Trying to add products from AliExpress into your WooCommerce store as well as keeping track of them is extremely time-consuming and difficult to keep organized. You would need to keep a spreadsheet of all of your products, their URLs, and availability on AliExpress. It would be difficult to maintain for the long term. The DropshipMe plugin enables you to quickly and easily import the best selling products from AliExpress into your store. Once you download the plugin, you can install it under the “Plugins” tab in your WordPress admin. Click on “Add New” and then you can upload the plugin from your computer. After it is uploaded and activated, you will need to copy and paste in your API key which was provided to you when you downloaded the plugin. This isn’t a huge deal, especially when starting out. When you receive orders, you will have to manually process them with AliExpress. However, as your store picks up in sales, you’ll likely want to automate this process. That is when you should invest in the AliDropship plugin. This plugin has a WooCommerce version included and will automate the key processes of your store including processing orders.